Available today only in Kindle format: How We Got the Bible by Neil Lightfoot. This is not the only book you need on this subject, but it is a good beginning source. Todd Bolen’s Bible Places Blog is the best source for keeping up with news and recent materials related to Bible Places. I am a fan of the Weekend Roundup, with links to a variety of helpful materials. 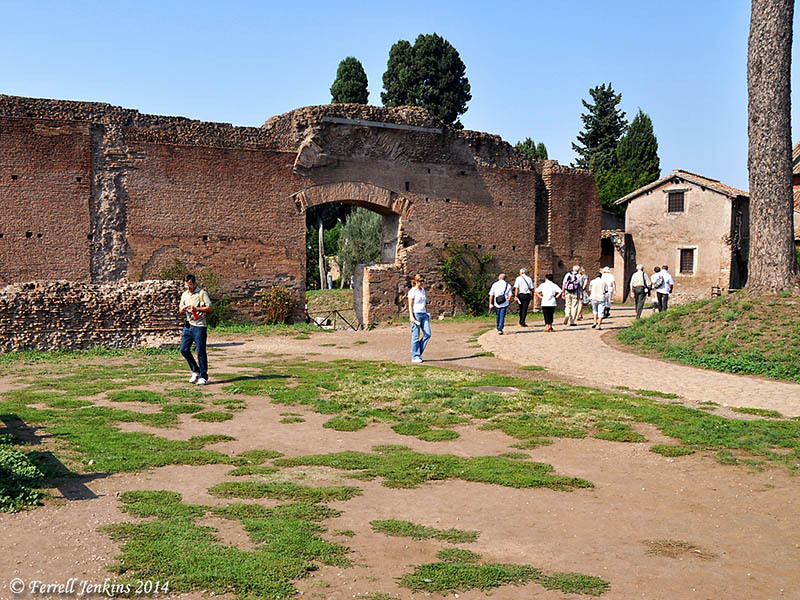 Today’s post reports that that rooms of Emperor Augustus on the Palatine Hill in Rome are now open to the public. Read here. House of Augustus on the Palatine Hill, Rome. Photo by Ferrell Jenkins. Charles Savelle provides a regular flow of links to helpful tools for serious Bible teachers and students at his BibleX (Bible Exposition). He recently pointed us to material on the Didache, The Dating of Deuteronomy and the Suzerain-Vassal Treaty Forms, and The Importance of Biblical Geography. I check this site regularly. I enjoy following Bible Lands Explorer, the blog of Mark Ziese. Mark is a unique writer. His most recent post points us to a Brazilian newspaper for which he provided photos of the Jesus Trail. You may not be able to read the Portuguese newspaper, but there is a nice slide show of Mark’s photos. How Wealthy Was The Temple In The First Century? Ancient History Encyclopedia. This is a nice site including an encyclopedia that is primarily intended for high school level. Includes Index, Timeline, Maps, Photos, Videos, etc. Check the article on Roman Roads here. ePlace. Research materials provided by Asbury Theological Seminary. Includes TREN collection of professional conference papers, dissertations, et al. The Journal of Inductive Biblical Studies. This journal is built on the well-known work of Kuist, Traina, and others who wrote on Inductive Bible Study. Daily Dose of Greek. Sign up for a 2-minute video Daily Dose of Greek by Rob Plumber, professor of Greek and New Testament at Southern Baptist Seminary. Mark Hoffman, Biblical Studies and Technological Tools, recently posted two helpful lists of Greek lexical forms. Click here. Resources to Help You Defend the Deity of Jesus. A list of resources by J. Warner Wallace, author of Cold Case Christianity. There has been much discussion in the past few weeks about the Noah movie. In last Saturday’s roundup, Todd Bolen called attention to the blog of Dr. Brian Mattson. In a post entitled “Sympathy for the Devil” Mattson comments about the movie. He reminds us of the following important point: The Bible is not the text for this movie. Several writers, and speakers, have pointed out that about the only things in common between the Noah movie and the Noah/Flood story of the Bible are a man named Noah, an ark, and water. Mattson claims and documents the philosophical background of the director of the movie in Gnosticism and Kabbalah. I am certain that many people will see the movie and have no awareness of that, just as many ready Paul’s epistle to the Colossians, and John’s epistles without understanding how they are responding to early Gnostic doctrines. Sympathy for the Devil. At the bottom of the article you will find links to a video and a follow-up post. The Wife of Jesus, again. It is almost Easter, so we can expect a rerun on various strange views about Jesus. I first called attention to this speculation about the wife of Jesus back in September, 2012, here. Todd Bolen recently commented on the same material that is now getting new attention. Here, he provides links to the article in the New York Times, and the Harvard Theological Review article by Dr. Karen King (available for download). The Times of Israel article is available here. 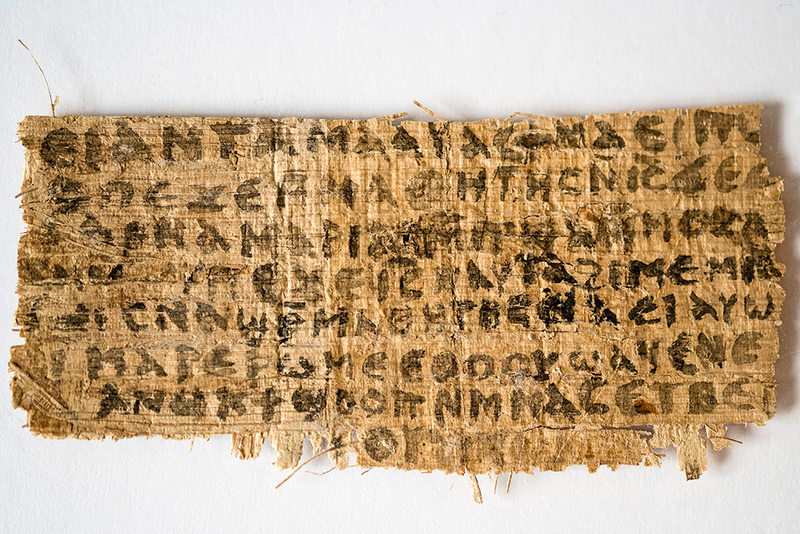 The GJW (Gospel of Jesus Wife) papyrus fragment possibly claiming that Jesus had a wife. Photo: Harvard University, Dr. Karen L. King. An initial radiocarbon analysis dated the fragment to 404–209 BC; a second analysis gave a mean date of AD 741. King concludes with a date in the 7th or 8th centuries AD. As far as being a reliable witness to 1st century events, it is not. The author notes that the fragment should be studied in light of the Muslim view that prophets were usually married. Larry Hurtado has written three posts about the papyrus document. Begin here and then scroll back for the other two. Carl Rasmussen’s recent Israel student group encountered a herd of about 15 wild boar at Caesarea Philippi. He provides some nice photos to back up his claim, and discusses the various Biblical references about swine. Access the HolyLandPhotos’ Blog here. Rob Bradshaw is making many books and journals available in PDF format. I check his BiblicalStudies.org.uk site regularly for materials that might be helpful in my study. Recently he called attention to a short video by Tim Bulkeley on how to access Bible commentaries without a library. The helpful, brief video is here. No camels during the Patriarchal Age? That’s what they are saying. It is a popular theme of those who want to put Bible believers in their place. Camels are mentioned repeatedly in Genesis 12-37, a section of Scripture set during the Middle Bronze Age (about 2100–1550 B.C.). Many of the well-known Bible characters of the Patriarchal Age are mentioned as riding camels. A few days ago I was beginning to locate my sources to respond to the recent article in the New York Times, and in Time. While I was working on Visualizing Isaiah, Todd Bolen came out with two great articles on the subject. I include these links for the two people who read my blog but do not read the Bible Places Blog. First, you should read the post about the Domestication of the Camel. Both are these posts are well documented with scholarly links you can track down to your own satisfaction. Don’t be unprepared the next time this subject comes up. 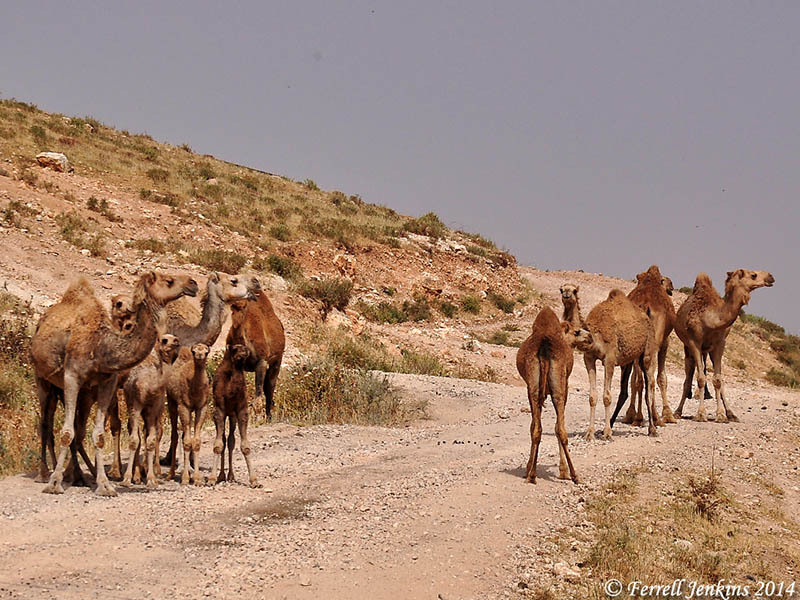 Camels at Abel-meholah, possible home of the prophet Elisha. Photo by Ferrell Jenkins. The Jewish Press reported here on the discovery of a Canaanite cult altar at Tel Rekhesh, an archaeological mound east of Mount Tabor. Archaeologists from the University of Tenri, Japan, and the Institute of Archaeology of Galilee Kinneret Academic College, have been working together at the site for the past six years. I have had the site on my “wish list” for the past three years, but have not yet visited the it. The same excavations also revealed large parts of a Jewish farmhouse dating back to the Second Temple. Researchers were able to establish that this was a place of Jewish dwellers based on typical stone tools, oil lamps and coins minted in the city of Tiberias. This region is located in the territory allotted to the tribe of Issachar (Joshua 19:17-23). Y. Aharoni identified Tel Rekhesh with the Biblical site of Anaharath (Joshua 19:19). Some of the findings from the site, collected by local people, are now exhibited in the archaeological museum in the Kibbutz Ein-Dor, some 5 km from Tel Rekhesh. The collection includes a fragment of Egyptian stela, a clay model of a temple, and complete pottery from various periods. The photo below is one I made earlier this year. At least seven of the artifacts displayed in this case are identified as being from Tel Rekhesh. Most of them are used in food preparation. The shrine in the center (“model of a temple”) is a replica. I failed to get a photo of the Egyptian stela fragment. At least 7 of the artifacts displayed in this case at The Ein Dor [En-dor, Endor] Archaeological Museum are from Tel Rekesh. Photo by Ferrell Jenkins. Click to enlarge. The web site for the Tel Rekhesh project is available here, but the content is not current. Todd Bolen includes a photo of Tel Rekhesh in the Tabor River valley here. This new edition consists of 18 volumes with nearly 18,000 photographs, adding hundreds of new sites and re-visiting the old favorites. 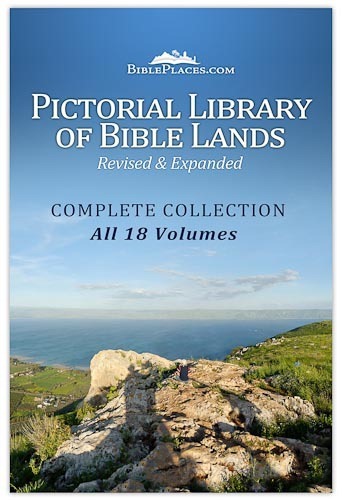 Here are just a few features of the new edition of the Pictorial Library of Bible Lands. Eight new volumes: (Lebanon, Eastern and Central Turkey, The Greek Islands, and more. New subjects include Cultural Images, Signs, and Trees, Plants, and Flowers. New Photos: For example, more than 1000 new photos have been added to the Jerusalem volume. New Photographers. In addition to the photos by Todd Bolen, the work of more than 40 photographers are included in this new set. New Maps. New, original maps have been created to identify the sites. New Indexes. Every photograph is indexed in a list of more than 400 pages. You get the hi-res photos and the photos already in PowerPoint. You can use the presentation as it is or include individual slides in your own lesson. Front cover of the new Pictorial Library Complete Collection. For those who already own the previous collection, Bible Places is offering the new 18-volume set for the upgrade price of $179. The entire set for new purchasers is $389. Would you prefer to make your own photos? Try buying a good digital SLR camera starting at about $1500, flying to Israel (not to mention Lebanon, Egypt, Turkey, Greece, the Greek Islands, Italy, et al. ), renting a car for a few weeks, buying the gas. Oh, and don’t forget to hire a private plane for a few hours so you can get some good aerial photos. That might cost at least $389. 🙂 And what if the lighting conditions were not right for a good photos the day you were at a site? What if you don’t have time to get your photos organized and write a description of each one? Need I go on to make a point? Did I mention that living and teaching in Israel for a decade helps? Every church should have a set of this material for the teachers to use in their teaching. Over the years I have found that some short-sighted groups (churches) will not make such an expenditure. The other choice is to buy the set for yourself. I hear several lessons a week, and every one of them could be improved by the use of photos from this wonderful collection. Charles Savelle has a good interview with Todd Bolen at the BibleX blog here. I have profited much from the work of Todd Bolen and am delighted to count him as a friend and to recommend this collection of photographs to every teacher of the Bible. Follow the BiblePlaces.com Blog here. Todd Bolen has posted his “Top 8 of 2008: Archaeological Discoveries Related to the Bible” at the BiblePlaces Blog. Take a look. Todd Bolen’s BiblePlaces Newletter for December is now available. It includes a wonderful aerial photo of the Elah Valley. The main feature is a series of (Google) satellite photos of Jerusalem with the natural features (hills, valleys, springs, quarters of the city, etc.) identified. If you teach any lesson dealing with the city of Jerusalem you need these PowerPoint slides. You should subscribe to the BiblePlaces Newsletter, but if you have not yet done so you may access the current issue here. The subscription link is at the bottom of the page. The photo below shows one of the modern gates of Jerusalem. It is labeled Stephen’s Gate on one of the slides mentioned above. Murphy-O’Connor says that Suliman called it the Bab el-Ghor (the Jordan Valley Gate). In Hebrew it is called the Lions’ Gate, but you may notice that the animals to the left of the gate are panthers. Murphy-O’Connor says this was “the heraldic emblem of the Mamluk sultan Baybar (1260-77). This is the only gate of the Old City on the east side that is currently open. Lions' Gate or St. Stephen's Gate. Photo by Ferrell Jenkins.